The Apostle John was an eye witness to the greatest event in world history. Well, to be accurate, John wasn’t actually inside the tomb when life returned to Jesus’s broken corpse. Nor did he actually witness Jesus sliding out of his grave clothes, taking off the white face cloth from his bloodied head and folding the linen neatly beside him. In fact, those closest to the action were four Roman soldiers who had closed the tomb with the official Roman seal and were guarding it with their lives (Matt 27:64-66 ). They felt the shudder of the earthquake and saw the angel of the Lord who rolled back the 2-ton stone from the door before sitting on it as if it were a deck chair. I wonder if the guards fainted before or after the angel had rolled back the stone to reveal a dead man walking! Perhaps just the sight of an angel dressed in white with a shining face was enough to shake those tough Roman guards and paralyze them with fear like dead men (Matt 28:2-4 ). Had John actually been an eyewitness to these events, his own shocked corpse may have been added to the empty tomb! On the first Resurrection Sunday in history, the disciples just went home! Verse 10 is the typical throwaway comment that only an eye witness mentions. But doesn’t it strike you as an odd response after realising that Jesus’s body was missing from the sealed and guarded tomb? Instead of looking for the risen Jesus, John clues us in on why they just went home: “For as yet they did not understand from Scripture that Jesus had to rise from the dead” (John 20:9 ). They were confused and slow to see the truth that was in front of them all along. Despite great miracles and Jesus’s prophecies of his death and resurrection, his disciples were slow to grasp the truth (John 20:9 ). The disciples had no idea what Jesus meant when He foretold that He would raise up the ‘temple’ 3 days after it had been destroyed, speaking metaphorically about the “temple of his body” (John 2:19 ; 21 ). After their rabbi was crucified, the disciples were humiliated, hopeless and in hiding. The trauma of the crucifixion was still raw in their minds. Resurrection was the last thing they expected. It is highly unlikely that this scattered, fearful group of disciples with no preconceived idea that Jesus would rise from the grave, could have colluded and fabricated a story of resurrection. From their viewpoint, their story had come to an abrupt end and there was no next chapter. What the disciples had believed about Jesus being God’s promised Saviour was in stark contrast with the mutilated, dead body they saw with their eyes. In fact, it was only women who were brave enough to go to the tomb early on Sunday morning to check on Jesus’ body (Luke 24:1 ). Women of the first century were not considered credible witnesses. Even the disciples accused Mary Magdalene, Joanna and Mary (the mother of James) of seeing “a vision of angels” and telling “idle tales”. No one believed their eye witness accounts (Luke 24:10-11 ; 23 ). The most unlikely witness of all was Mary Magdalene, whom Jesus had freed from seven demons (Luke 8:2 ). If John were fabricating a story, this loyal lady was not an ideal witness to put at the scene of the tomb (John 20:1 ). But just as Mary Magdalene was last at the cross, she is first at the grave. Mary’s grief is palpable as she stands outside the tomb crying (John 20:11 ). Imagine her confusion as she sees the ‘gardener’ and asks him where he has put the body. Imagine her joy as she hears Jesus calling her name and finally recognizes Him as her “Rabboni!” Isn’t it just like Jesus’s topsy turvy kingdom to choose Mary Magdalene as the first messenger of the resurrection? Mary is not unlike the Samaritan woman at the well who sees Jesus for who He is and becomes the first missionary to the Gentiles (John 4:39 ). Jesus speaks her name. Mary sees and instantly believes(John 20:11-18 ). “O foolish ones, and slow of heart to believe all that the prophets have spoken! 26 Was it not necessary that the Christ should suffer these things and enter into his glory?” 27 And beginning with Moses and all the Prophets, he interpreted to them in all the Scriptures the things concerning himself” (Luke 24:25-27 ). Despite their knowledge of the Jewish Scriptures, the two disciples could not see that their whole Old Testament was peppered with prophecies of the death and resurrection of God’s Messiah. Imagine the disciples’ flash of insight as they recalled a picture of their patriarch Abraham and his obedient son, Isaac, carrying a bundle of wood up Mount Moriah… Just like the stooped figure of Jesus walking up Calvary in obedience to his Father, bearing a heavy wooden cross (Gen 22:6 ;9 ; John 19:17 ; Luke 22:42 ). Imagine the amazement of Cleopas and his companion as it slowly dawned on them that even Judas’s betrayal of Jesus fulfilled what was written in the Old Testament (Acts 1:16-20 ). They would have realized that the crucifixion was no mistake but part of God’s great redemptive plan since the beginning of time. How I wish I could have been part of that road trip to Emmaus as the Lord Jesus miraculously turned the lights on little by little! Their vision finally cleared and their burning hearts believed it. It is the miracle of seeing and believing that every follower of Jesus experiences somewhere on their spiritual journey. Faith in Jesus Christ is not a crutch for the gullible and blind. John’s gospel is a cameo of the last three weeks of Jesus’ life through the eyes of a credible witness. It was written for an express purpose. “But these are written that you may believe that Jesus is the Messiah, the Son of God, and that by believing you may have life in his name.” (John 20:31 ). Believing Jesus’ resurrection is no small issue of personal preference. Life is at stake. John asks us to believe his own testimony of the day he saw Christ’s grave clothes and folded face cloth in an empty tomb. John speaks of himself when he says, “He saw and believed” (John 20:8 ). The empty tomb, rolled away stone and folded linen cloths were the basis for John’s belief. It was not blind faith but faith based on what John saw. Later he was even more convinced when he saw Jesus with his own eyes in the upper room and spent 40 days with Him before his ascension (Mark 16:14 ). John writes to convince us, who have never seen Jesus with our own eyes, that his resurrection is true (John 20:29 ). If the resurrection is not real, Easter Friday is terrible news. In fact, the whole Christian faith is rubbish. Easter is a sick joke, our prayers a waste of breath, and we are naïve, gullible, deluded fools. Worst of all, we have no hope for ourselves beyond the grave. The Apostle Paul thought so too (1 Cor 15:1-20 ). But John, Peter, Mary Magdalene, Paul (an enemy of Christians), James (the skeptical brother) and hundreds of other men and women who saw the risen Jesus— knew without a doubt that they were not deluded. They ate and spoke with him. It may have taken some of them longer than others, but when they believed, they were tortured, killed, disowned and exiled because they could not keep silent about what they had seen with their own eyes. We too are called to see and believe in Jesus as the risen Lord. Not with our physical eyes, because Jesus is no longer with us, but by coming face to face with the eye-witness accounts of the New Testament. They show us the face of Christ in his life, death, resurrection and ascension. We cannot re-play history, but we can weigh up the credible testimonies of the apostles and offer a verdict of true or false. We must choose to believe or disbelieve, but there is no middle ground. I believe Jesus rose from the dead beyond all reasonable doubt. I believe He conquered every enemy of God when He died on the cross and rose as King of the universe, the Root of David, the Lion of Judah! (Rev 5:5 ) I believe Jesus is the Lamb who died to ransom people from every tribe and language and nation, appointing us to be a kingdom and priests to serve our God (Rev 5:9-10 ). And I long for the day when I will see with my own eyes, hear with my own ears and stand with the thousands upon thousands of people and angels worshipping the Lamb on the throne! (Rev 5:11 ;12 ;13 ; 14 ) The greatest prayer of my heart today is that you will be there too. Have you looked at the evidence for Jesus’ resurrection and do you believe it is true? If you are sceptical, you owe it to yourself to investigate this for yourself. Here are two places to start: Lee Strobel’s testimony and video The case for the resurrection and Frank Morison’s book Who moved the Stone? (click on the links). Jesus requires us to know the reason for the hope we have and to share it. Who will you share the gospel with this Easter? Pray for eyes of unbelieving friends and family to be opened to see and believe in Jesus as their Lamb and Lord. No one can see it unless Jesus shows it to us. Thank you, Jesus, for opening my heart and mind to the truth that you really died and rose to life again. Thank you that you are my own Saviour, not only at Easter but all year round. Like those disciples on the Emmaus road, please give me a burning heart to return to my friends and tell them that you have risen, that I know you and that you are our only hope. Give me the courage and the words to convince them of this truth. Thank you that you are my substitute Lamb and also the Lion of Judah who rules over the universe and will one day judge justly. Thank you that your body was broken on the cross to make me whole and that you rose again to give me life—- Life that is full, free and forever. Give me eyes to see you more clearly and a warm heart to love you more dearly each day. Worship and meditate on the cross this Easter! Elizabeth Cecelia Douglas Clephane (1830 – 1869) was a Scottish songwriter who wrote this beautiful hymn “Beneath the Cross of Jesus.” Spot her Old Testament references as you meditate on the meaning of Easter. So seems my Saviour’s cross to me, a ladder up to heaven. The day Jesus died was not a dark night but a dark day. At noon the sun disappeared and the sky grew dark in Jerusalem. This strange darkness is mentioned by secular historians like Thallus, Phlegon, Africanus and Tertullian. Just as the night skies were lit up by a bright star and choirs of angels on the night of Jesus’ birth, God turned off the sun’s light on the day His Son died. Without a doubt, the darkness was an ‘act of God’ in the truest sense. The darkness was real and not a metaphor. It was the ominous sign of God’s curse on Jesus as He bore all human sin and rebellion as our substitute. Then came Jesus’s anguished cry, “My God, My God, why have you forsaken me?” It silenced the mockery of the priests and hushed the insults of the passers-by and the criminals being crucified alongside Jesus. Then came another divine intervention. The temple curtain was ripped in two from top to bottom. What was so striking about those three hours that caused a hardened Roman centurion to confess, “Surely this man was the Son of God!” What did the soldier see in Jesus that changed him so radically to make this stunning confession? And it was the third hour when they crucified him. 26 And the inscription of the charge against him read, “The King of the Jews.” 27 And with him they crucified two robbers, one on his right and one on his left. 29 And those who passed by derided him, wagging their heads and saying, “Aha! You who would destroy the temple and rebuild it in three days, 30 save yourself, and come down from the cross!” 31 So also the chief priests with the scribes mocked him to one another, saying, “He saved others; he cannot save himself. 32 Let the Christ, the King of Israel, come down now from the cross that we may see and believe.” Those who were crucified with him also reviled him. The problem with Phelgon’s naturalistic explanation is that an eclipse could not have caused the darkness. Jesus was crucified the day before Passover and eclipses do not occur during the full moon. The fact of the darkness is not in doubt from a historical point of view, just its cause. The three hour darkness on the day of Christ’s crucifixion reminds us of the ninth plague when an ominous darkness settled over Egypt for three days preceding the death of the Egyptian firstborn sons. It was a sign of divine judgment to come. Yahweh himself entered the darkness of Egypt to liberate his people who were sheltered by the blood of the lambs they had sacrificed and eaten the previous night. That was the first Passover when the angel of death passed over the Israelite homes. Was this first Easter Friday not a ‘bitter day’ when God the Father made the sun go down at noon in mourning for His only beloved Son? Even the Roman centurion realized that the crucifixion was no ordinary death. On the cross, God’s beloved Son died as the perfect Passover sacrifice. Through his death, Jesus reversed the curse that Adam and Eve brought upon creation when they refused to live under God’s rule (Gen 3:10 ; 17-19 ). Paul reminds us that only Jesus is qualified to redeem us from the curse of God’s judgment. Jesus became cursed in our place, so that every sinner may receive the blessing given to Abraham, through faith in Him. His willing death reversed the curse. (Mark 15:34 ; 37 ; 38 ). The centurion at the cross must have often heard the agonized shouts of condemned men, but Jesus’s cry was different. Mark records his actual words in Aramaic to heighten the intensity of Christ’s anguish as He was separated from His Father for the first time in all eternity. “My God, my God, why have you forsaken me?” This was a precise echo of David’s divine abandonment a thousand years before (Ps 22:1 ). The essence of sin is that we forsake God. We reject His rule over our lives and disbelieve his word, just as Adam and Eve did. As a result of our sin, we are God-forsaken and alienated from Him, just as Adam and Eve were banished from the Garden. The temple curtain was the symbol of that separation. The curtain blocked sinful people from approaching God’s presence in the Holy of Holies. But when Jesus died and took the punishment for sin instead of us, God ripped this curtain from top to bottom to make a bold statement. Jesus is the rip in the curtain! “…we have confidence to enter the Most Holy Place by the blood of Jesus, 20 by a new and living way opened for us through the curtain, that is, his body” (Heb 10:19-20 ). “But when Christ came as high priest of the good things that are now already here, he went through the greater and more perfect tabernacle that is not made with human hands, that is to say, is not a part of this creation. 12 He did not enter by means of the blood of goats and calves; but he entered the Most Holy Place once for all by his own blood, thus obtaining eternal redemption” (Heb 9:11-12 ). God had the last word to the chief priests and Pharisees by tearing the curtain and opening up the way to the Holy of Holies. Jesus is the Saviour of every undeserving sinner who calls to Him, no matter what you have done or where you have been. The only condition is that you look to the perfect Passover Lamb as your own Saviour and Lord. Easter is good news for every sinner who has repented and believed in Jesus, the Son of God. Otherwise, Easter is nothing more than a season of empty rituals, just as the Passover was to the religious leaders of Jesus’s time. They trusted in their own righteousness and did not think they needed God’s Passover Lamb. They refused to walk through the torn curtain into the embrace of God the Father. Do you live today with full assurance that you will live forever? “For me it was the transforming revelation. Jesus was the substitute—the ultimate, final, complete, perfect and irrevocable substitute lamb. (Branded by Grace by Chippy Brand: p74). But unlike every other Old Testament lamb that went before him, Jesus was a willing sacrifice. Unlike the Passover lamb that was slain and the Scapegoat that was sent out into the wilderness bearing the sins of the people, Jesus allowed himself to be led to the cross without compulsion or fight. He submitted to his Father’s will even though he knew it would cause him indescribable physical and spiritual agony. Even to the point of being forsaken by his Father, “smitten by God and afflicted” (Isa 53:4 ; Ps 22:1-2 ; Matt 27:46 ). As the Son of God He was far from defenceless, yet he chose to be as meek as a lamb. He refused to use his divine power to defend himself (Matt 26:52-54 ) so that his righteousness could be proclaimed “to a people yet unborn, that he has done it” (Ps 22:31 ; John 19:30 ; Heb 10:10 ; 12 ; 14 ; 18 ). He was the Son of God but also the Son of man. Substitution is not something our culture generally mentions much, except perhaps on the sport’s field, but the Bible tells us that the essence of sin is that men and women substitute ourselves for God (Rom 1:21 ;23 ). We worship ourselves instead of God. We place ourselves on the throne where only God deserves to sit. We claim the authority that belongs only to God. And that is exactly who Isaiah’s ‘suffering servant’ is: God in the flesh. He is Jesus, the God-man that John the Baptist pointed to when he said, “Behold! The Lamb of God who takes away the sins of the world” (John 1:29 ). The problem is that no human being can offer true atonement. Not for ourselves or on behalf of anyone else. Each one of us is a sheep that has gone astray, turning to our own way (Isa 53:6 ). We do not follow the Shepherd of our souls and we have all sinned against a holy God, who cannot allow sin into His heaven. Just as Adam and Eve forfeited their home, peace and life in Eden, we forfeit ours because we have wandered like rebel sheep. Paradise is lost. The good news about Good Friday is that Jesus, the perfect God-man, is the only One qualified to pay the debt we cannot pay ourselves. The Lamb of God offers us full, final, ultimate atonement, and there is nothing we can do to add to this (Heb 9:28 ). Just as Jesus promised the believing thief on the cross “paradise”, He offers every rebel sheep an eternal home with Him. In a grand twist, the slaughtered Lamb becomes the Good Shepherd of those who trust in Him for themselves (John 10:11-18 ). The first free gift of Good Friday is eternal life for those who believe (Rom 6:23b ). There is nothing insignificant about the great exchange. We give him our sin and death. He gives us his righteousness and life. “For our sake he made him to be sin who knew no sin, so that in him we might become the righteousness of God.” (2 Cor 5:21 ). “Upon him was the chastisement that brought us peace” (Isa 53: 5b ). “Out of the anguish of his soul he shall see and be satisfied; by his knowledge shall the righteous one, my servant make many to be accounted righteous.” (Isa 53:11 ; John 12:27 ; John 17:1-5 ). Those who believe are free from blame, condemnation, judgment and the curse of death forever. If you have never experienced Christ’s redemption, what is stopping you from taking up the great exchange and grasping the gifts of Easter for yourself? Without atonement from the Lamb of God, how do you hope to stand before God in judgment? (2 Cor 5:10 ; Rom 14:12 ; 1 Cor 4:5 ) In what or whom are you trusting for atonement? As we approach Easter, let us drink deeply of the truth that in Jesus’s death, death has been swallowed up in victory (1 Cor 15:54 ). Holding onto truth is one of the signs that God’s Spirit is alive and active in us. Sanctification is not about constantly seeking new experiences or signs from God, but about reminding ourselves of what we already know and allowing the Spirit to make this truth real in our lives. As John puts it, “See that what you have heard from the beginning remains in you (1John 2:24 ).” “Just as you were taught…” writes Paul (Col 2:7 ). It is not a new story, but the old story that will anchor us in shaky times. Paul tells us to walk in Christ, to be rooted, established and built up in Him, to allow the word of Christ to settle and find a permanent home in us; to constantly remind ourselves and each other of the truth we share; to sing the truth of the gospel aloud with thankful hearts (Col 2:6-7 ; Col 3:15-16 ). The word of Christ is so easily lost in the clutter and endless activity of our lives. It takes discipline to meditate and muse over God’s truth, but the “peace of God (that) will rule our hearts” is incomparable reward (Col 3:15 ). But the Bible is God’s voice to us! Do we actually believe this? Through Biblical text, the Holy Spirit awakens us to what God is really like. God’s word is an accurate mirror to expose our sin. It is a surgeon’s scalpel to peel back the truth of our bankrupt, desperate state. It is a compass to direct us to the only person who can rescue us from death and draw us back to our Father. From Genesis to Revelation, the Holy Spirit narrates God’s truth to us, showing us exactly how to know Him, grow up as His child and prepare to enter His heaven when we die. Without Scripture, man’s words are mere opinions that cannot keep us stable in shaky times. They have no power to save us, give us inner peace or keep us firm to the end (Heb 3:14 ; Mark 13:13 ). They may even deceive us and lead us astray (Rom 16:18 ). Man’s endless invention is no gospel at all (Gal 1:6-7 ). Ask questions (Ps 77:5-9 ). Asaph the Psalmist writes, “My spirit made a diligent search…” You and I can ask ourselves: “What difference does this make to my life? In whom am I trusting? Have I forgotten this truth? Am I living in the light of this truth?” God can handle our questions and they recalibrate our thoughts and feelings to reflect the truth. Argue your case before God. Appeal to his character and promises. (Ps 77:10 .) Remind God of his names, his love and his goodness until you are sure it is true. Wrestle with God. Recall God’s great deeds. (Ps 77:13-20 .) Muse on what God has done for you in the past to give you hope, strength and victory in the present. Like Asaph, preach the truth to your shaky heart. Remind yourself of his steadfast love and faithfulness to all generations. Meditate on all that Jesus’ death achieved and pray back these truths to God. Give thanks for his resurrection and ascension; his specific kindnesses to you and answered prayers. Name your blessings one by one. By mentally circling around God’s greatness through meditation, we reverse the obsessive cycle of anxious thoughts that often trouble us. When Banks train their staff to spot counterfeit notes, tellers are made to handle authentic money over and over again. They are taught to study the colours, texture, weight and images of the bills carefully. By being familiar with the real thing, they are equipped to spot the counterfeit. So too with God’s people. We need to be so steeped in the truth laid out plainly in God’s Word, that we instantly spot strange teaching when we hear it. New Testament writers and Jesus himself made it clear that false teaching will come from within the church (2 Peter 3:17 ; Mark 13:22 ). Only Christians who are tethered to Biblical truth will stand firm against the many “winds of teaching” which can toss us back and forth (Eph 4:14 ). John calls all Christians living in “the last hour” not to be naïve or gullible, but to hold onto the one true gospel and know the real Jesus for themselves. That is how God equips us to spot the counterfeit. John is reiterating what Jesus already said (John 15:4 ;5 ;6 ;7 ; 1 John 2:27b ). It is the open secret of the Christian life: If we are to grow up and bear fruit as Christians, we must remain in Christ, like a branch in the mother plant. “Remain” is from the Greek meno, meaning to abide, dwell, continue, be present, to wait, to stand. It implies a consistent, constant, close attachment to both the person of Christ (the Word), as well as the written Word of God, which contains the full story of redemption history from cover to cover. John says we must see that what we have heard from the beginningremains in us (1 John 2:24 ). We are to guard this truth as if it were a treasure that God’s enemy is doing his best to destroy…which he is. After all, eternal life hangs in the balance (1 John 2:25 ). That is why John warns Christians about false teachers who lead God’s people astray (1 John 2:26 ). False teaching is a lie directly from the lips of the enemy and is only combatted when ordinary Christians know the truth for ourselves. That is why those who teach or influence Christians carry a great responsibility. They answer to the Lord Jesus himself. Their overarching role is to equip God’s people to serve Christ and to build up the body of believers to be unified in their faith and to live in a personal relationship with Jesus, the Son of God. Why? “So that we will longer be infants, tossed back and forth by the waves, and blown here and there by every teaching and by the cunning and craftiness of people in their deceitful scheming.” (Eph 4:11-14 ). We need leaders to fearlessly speak God’s truth into our lives to anchor us in the turbulent times in which we live. The writer to the Hebrews reminds us that nothing has changed. “Jesus is the same yesterday and today and forever. Do not be carried away by all kinds of strange teachings” (Hebrews 13:8-9 ). We must not be sidetracked. Our culture of tolerance invites us to feast on a buffet of ideas, but there is only one true gospel and one name by which we can be saved (Gal 1:6-7 ; Acts 4:12 ). We cannot obey God or love our neighbour if we do not know and love the truth. Like the first century Gnostics who spoke under the banner of Christ, there will always be teachers who add extras to the gospel of grace (Heb 13:9 ). False teachers will always feed their own appetites before serving our Lord Jesus. They will sow division and confusion rather than unifying and building up. “By smooth talk and flattery they deceive the minds of naïve people” (Rom 16:17-18 ). False teachers will continue to speculate about the future and obsess about myths, genealogies and meaningless talk that do not advance God’s work (1 Tim 1:4-6 ). “For there will come a time when people will not put up with sound doctrine. Instead, to suit their own desires, they will gather around them a great number of teachers to say what their itching ears want to hear” (2 Tim 4:3 ). It is true that half hearted worshippers will love inoffensive teachers who dilute the truth. Looking around at the visible church today, nothing has changed since the first century. John tells ordinary Christians that we must be so familiar with the truth passed down by Jesus and the Apostles, the message we first heard, that we are not dazzled by diversions (1 John 2:25-26 ). Teaching is not a matter of innovation but of constant reminding of the truth. Truth is not a novel insight. Nor do only a select few with ‘special anointing’ have access to it “All of you” and “all things” are comprehensive terms (I John 2:20 ; 27b )). Jesus said that the Spirit will lead into truth all those who belong to Him, not just an elite few (John 16:13 ). The Spirit’s anointing is every Christian’s birthright (2 Cor 1:21 ; Eph 4:7-8 ). It is subjective proof that we are God’s children. That is why John can say with confidence; “All of you know the truth” (1 John 2:20 ). The Spirit inside us will warn us when we hear something that jars with the truth and we must pay attention to those uneasy promptings. It is a heart knowledge. But our knowledge of truth is also based on the objective reality of the real Jesus of history, the Son of God who existed from the beginning, who came to earth as a baby in Bethlehem, fully man yet co-equal with God. We learn the truth about his life, death, resurrection and ascension in the eye witness accounts of the New Testament. We see shadows of Him throughout the Old Testament. We are told the truth of the war that is raging now between the armies of heaven and hell in this era called ‘the last days’. And we are assured of the final consummation when Jesus returns as Judge and King of the new heaven and new earth. The Bible is a true account of history and God’s extraordinary plan to save the world through his Son. It is this precious truth that gives us the hope of eternal life (1 John 2:25 ). We are stewards of this truth to pass on to future generations. There are no short cuts to being good stewards of truth. We must engage with our Bible and steep ourselves in its truth from beginning to end. We must tremble at God’s word as we seek to handle it properly (Isa 66:2 ), especially if we have influence over others. We must not twist the plain truth of the Bible to support our own agenda. We must have a plan to read Scripture for ourselves and not just listen to what other people say about it. We must choose a local church which faithfully teaches the whole counsel of God’s Word, not just the bits the preacher fancies. The Gospel Coalition US and The Gospel Coalition Africa websites. “We know that we have passed out of death into life, because we love each other. Whoever does not love remains in death” (1 John 3:14 ). We are dead to sin and alive to Christ. We walk in the light, not the darkness. Obedience is our first mark of distinction (See Our Holy Heritage; Kill sin before it kills you). Our second trademark is that we will love God and each other because God is love. We love, because God first loved us” (1 John 4:8 ; 10 ; see Gripped by love). Love cannot save us, but love demonstrates that we are born again. It is visible proof that God’s invisible Spirit is changing us day by day. It is the practical expression of living in submission to Christ, our ‘Bridegroom’ and the ‘Vine’ that produces good fruit in us moment by moment. The more we love God, the more we will love the people He has made in his own image. Love is… action not words. Love is… laying down our lives for others. Let us pray that God’s Spirit would change us profoundly, moment by moment, to enable us to practically love our neighbours as we love ourselves. 20 If anyone says, “I love God,” and hates his brother, he is a liar; for he who does not love his brother whom he has seen cannot love God whom he has not seen.21 And this commandment we have from him: whoever loves God must also love his brother. The message you have heard from the beginning. We live at a time when people disdain the old and uncritically fawn over the new. John is speaking to Christians living in an age of Gnosticism similar to today’s ideologies. False teachers were offering a mystical door to salvation. The Athenian mindset of John’s day was obsessed by new ideas (Acts 17:21 ), spiritual experiences and special knowledge and revelation. But John reminds them that Jesus is the God-man who came to earth in real space and time. His physical body died and came back to life. Jesus is now with his followers by his Spirit. The message of Jesus and the apostles is down-to-earth. It has no shades of grey or mirky shadows. It is the truth that ‘was from the beginning’– not hearsay but first hand knowledge (1 John 1:1 ; 2 ; 3 ). Faith in this Jesus, whose narrative is told in the eye witness accounts of the New Testament, is the only basis for fellowship with God the Father. Like the true Jesus, true love has no shades of grey. “But if you do not do what is right, sin is crouching at your door; it desires to have you, but you must rule over it” (Gen 4:7 ). God, who knows Cain’s heart, warns him to guard it. But Cain does not master his desires. He shows a settled refusal to soften his hard heart. His envy of his brother gives rise to hatred, and hatred manifests in murder. The Bible talks of envy as coveting. In Cain’s case, breaking the 10th commandment, “Do not covet” leads him to murder his own flesh and blood. Joseph’s brothers show the same progression from envy, to hatred, to selling Joseph as a slave. Humanity in 2019 is no different from our ancestors in Genesis. The heart is the wellspring of life and all our outward actions flow from it (Prov 4:23 ; Matt 15:18 ). We must search our hearts often with these two tests: Contentment and Envy. Coveting is inward rot that spills its poison into our outward actions and words, as it did in Cain’s life. I know in my own life that coveting leads to ingratitude, anger and many other sins in my own life. Love and coveting cannot co-exist. We are either led by the spirit of Cain or the Spirit of Christ. Christ’s love always travels from the heart to the hands and feet of those ruled by His Spirit. Like the good Samaritan, a Christian who is Spirit-led cannot look away when someone is in need or distress (1 John 3:17 ; Luke 10:25-37 ). It is easy to love ‘everyone’ in a vague, generic kind of way, but much harder to love someone in particular. It is easy to avoid someone in need than to get up close and personal, to see and hear them, to share their suffering (Luke 10:33 ). It is easy to be moved and to feel pity, but it is another thing to give up our time; to bandage up someone’s ‘wounds’; to use our car, our home and give up our money (Luke 10:34-35 ). Most of us will not die martyrs as Jesus did, but we are still called to lay down our lives for each other, especially for believers (1 John 3:16 ; John 15:12-13 ). Of course we cannot meet every need or save the world. Jesus himself did not heal everyone. But love comes from the conviction that every life matters to God. Love starts with small things. That may mean laying down just a part of my time and energy to connect with a brother or sister in need. Love is holding loosely to our comforts, our schedule, our dreams, our money and our desires so that we can care for people (1 John 3:17-18 ). Love may mean giving away a whole chunk of our lives as we look after an elderly parent or sick friend, or raise an adopted child. Love means never standing in the way of another’s holiness, nor taking what does not belong to me sexually from another person. Love treats every person with dignity, while racism embodies the spirit of Cain. Love is being thoughtful and not irritable or resentful. Love does not want what someone else has (1 Cor 13:4 ). Love does not have a need for special attention or recognition (1 Cor 13:4-5 ). Love patiently bears with people rather than quarrelling and gossiping ( Cor 13:7). Love makes peace and is not rude (1 Cor 13:5 ). Love does not sow division, pick fights or take revenge (1 Peter 3:9 ; Rom 12:17 ). Love believes the best even when people disappoint us. Love is not a matter of word and talk, but of action and truth (1 John 3:18 ). The Biblical definition of love is down to earth: We cannot claim to love an invisible God if we do not love the real flesh and blood people around us. We demonstrate our love for God by practically and sacrificially loving each other. This is not a new message on love. Love fulfills the Old Testament Law and prophets (Rom 13:8 ;9 ;10 ) and has always been God’s greatest commandment (Matt 22:40 ). It is not only good doctrine and faithful preaching of the word that draws people to Jesus. It is also the sweet witness of love in our church community that convinces people that the gospel is true. Love is not self determinism. Love is self sacrifice. John says we should not be surprised when the world hates us (1 John 3:13 ). If Cain represents the world and Abel symbolizes faithful believers, the way of the world is to covet and drag others down in order to pull oneself up. Just as Cain hated Abel for his righteousness, many people feel threatened by Christians who don’t strive and jostle for position. Light exposes darkness. The world hated God’s prophets, Jesus, the apostles and faithful Christians throughout history. Love, light and life will always be at war with hatred, darkness and death. Rather, we should be surprised if we always have the world’s approval and acceptance. The world’s love is not something to be envied. The question John asks us throughout his letter is this: Which side are you living for? “Do not waste time bothering whether you ‘love’ your neighbor; act as if you did. As soon as we do this we find one of the great secrets. When you are behaving as if you loved someone, you will presently come to love him.” C.S Lewis. Mere Christianity. We are born lovers. It is written into our DNA as human beings. It’s not a question of whether we love, but whom we love. The object of our affection will grip our heart, no matter what we say we believe or think. Whoever holds the key to our heart will determine how we will live and die. The Apostle John says that being filled with love is the second proof of being ‘born of God’. The first proof is that we obey God (see Kill sin before it kills you). John tells us that there are two opposing forces that vie for our love. Like light and darkness, they cannot be fused and have nothing in common. Either we will love God or we will love the world. Do not love the world or the things in the world. If anyone loves the world, the love of the Father is not in him. 16 For all that is in the world—the desires of the flesh and the desires of the eyes and pride of life is not from the Father but is from the world. 17 And the world is passing away along with its desires, but whoever does the will of God abides forever. 16 So we have come to know and to believe the love that God has for us. God is love, and whoever abides in love abides in God, and God abides in him… 19 We love because he first loved us. 20 If anyone says, “I love God,” and hates his brother, he is a liar; for he who does not love his brother whom he has seen cannot love God whom he has not seen. 1 John 4:19 was the first Bible verse I ever learned by heart: “We love because He first loved us.” My toddler version was: “I wuv God ‘coz he first wuved me,” and I repeated that verse like a parrot because it made me feel good. God’s love is personal to me. It has made all the difference to my life, and has, over time, shaped crucial decisions and the places I seek security and joy. Every time I bump my head against sin and become aware of how lost and weak I am in myself, God’s love shines warmer and brighter as I realise just how undeserved his grace is. My Saviour’s love has freed me up to love people without worrying if there will be anything left over for me. I know He loves me today as much as He will love me on the day I take my last breath. He will love me in sickness and in health, for richer and poorer, in wise moments and in stupid ones! And death will never part us. According to John, God’s love is what every child of God can “come to know and believe” as a fact, not just a theory (1 John 4:16 ). We are supposed to experience it as a reality for ourselves, because God has shown his love to us in a way that we cannot dispute (1 John 4:9-10 ). Because the holy God of the universe laid down his life for ours as a propitiation* for our sins, we can stake our life on this love. Even when it feels as though God is silent or has forgotten us. Even in the darkest dead-end streets of life, we can depend on it—without a shadow of doubt. For many years now I have led women’s Bible studies attended by ladies from a range of denominations, personalities and cultures. This week I have been with my children at university and attended my daughter’s student cell group. Beyond superficial differences in age, style and denomination, there is one quality that always arrests me in a community where God’s Spirit is alive and well: There is a tender affection for the Lord Jesus Christ. Christians who are growing and being sanctified by the Holy Spirit are eager to serve and obey God more, not out of duty or fear, but from a place of deep love and devotion. Even when they are struggling with life and have honest questions about their faith, they talk of Jesus in a personal, excited way as if He is precious and lovely to them. They are deeply offended if His name is dishonoured. For those who understand the gospel of grace, it is only natural to be completely devoted to the person who has rescued you from the precipice of disaster and death. And it is only logical that when you are gripped by God’s love, you will be moved by it to love others. It is a matter of cause and effect for Christ’s Beloved, as indeed we are if we are born again and know God (1 John 4:7 ). This world is not going to last, nor anything in it. Getting cozy with the world is like embracing a phantom in a fog. If we are gripped by love of the world, we will stumble about aimlessly, eventually losing our way and wasting our life on stuff that is passing away—like vapour that slips through our fingers. The world has a very short shelf life and we will have nothing to show for our investment in it. By contrast, living a life to please God is making an investment that lasts for all eternity (1 John 2:17 ). I am not a good shopper, and whenever I have spent longer than an hour at a shopping Mall, these words of Wordsworth’s poem ring like an alarm bell in my mind! Lust of the flesh and desire of the eyes is thirst for pleasure in things God has not designed to satisfy us. Selfish lust will always oust love, which is other-centred. Desire of the flesh and eyes is an inward-focussed striving or craving to have our needs met by whatever we have set our heart on– something which we do not have but yearn for. We give our heart away to what we desire most (Matt 6:21 ). Pride of life is boasting (even silently) in things we do have– talents or things we have achieved, earned or acquired. When we give our heart away to pride, we stop loving God and others, and start serving ourselves instead. As long as we live for our own glory, we will always fear losing what the world has given us. Money can be a powerful symbol of self glory in a divided heart. That’s why Proverbs 62:10 gives us a wise warning, “If riches increase, set not your heart on them.” And the writer of Hebrews reminds us, “Keep your life free from love of money, and be content with what you have, for he has said, “I will never leave you nor forsake you” (Hebrews 13:5 ). Loving the world always results in a cold heart towards Jesus. Our devotion to Him will become lukewarm and we will soon make excuses to avoid reading the Bible, praying and spending time with God’s people. It is hard enough to serve Jesus in a hostile world, but if we cling to the world’s trappings, we will lose our distinctive ‘saltiness’, becoming useless disciples (Matt 5:13 ). Flirting with the world is called ‘idolatry’ and is seriously offensive to God. We can no longer worship God with a full, blazing heart, in spirit and in truth. James puts it bluntly: Friendship with the world leads to enmity (hostility) with God (James 4:4 ). Prioritise time with the Lord, go for a long walk with Him, talk about what He has done for us, remind ourselves of our first spark of love when we were born again. Stay accountable and confess our sins to Christian brothers and sisters. In this way, we do not give the world a gap to woo us. Intimacy with God is something that is built over time, laying down one small brick of love at a time. Intimacy grows through feeding our appetites godly food and placing ourselves in the three channels of grace God has provided to keep our affections alive to Him: 1. Daily reading of Scripture. 2. Prayer. 3. Meeting with God’s people (see David Mathis’s book titled The Habits of Grace). Who of us doesn’t struggle daily with desires of the flesh, the eyes and the pride of life? But we will only loosen the world’s grip on our heart through a more powerful devotion to Jesus, who is infinitely greater than the one who is in the world (1 John 4:4 ). Christian ministry is dangerous without this powerful devotion to Jesus, the Saviour. That’s why our risen Lord asks Peter three times, “Simon, son of Jonas, do you love me?” Before Peter is commissioned to feed the church, he is not asked, “Do you believe me?” or “Will you obey me?” Or “will you serve me?” Love is the foundation of our faith and our ministry. “Do you love me?” is the most searching question Jesus asks every Christian, since each of us has been sent into the world as His ambassador. “We love because He first loved us” (1 John 4:19 ). The love that grips our hearts will make the world of difference. Is it the love of Christ… or the world? What do you think of most of the time? Turn now to Jesus and ask Him to be the centre of your thoughts, your focus and your desires. Sing this wonderful hymn to remind yourself of your Messiah, “who holds forever those he loves.” Is He worthy, by Andrew Peterson. “There is a way that seems right to a man, but its end is the way to death.” (Proverbs 14:12 .) Paul expands this proverb in Romans 8:13 : “For if you live according to the flesh you will die, but if by the Spirit you put to death the deeds of the body, you will live.” A Christian is called to be a sin slayer. 1 John 1:5-7 : This is the message we have heard from him and proclaim to you, that God is light, and in him is no darkness at all. 6 If we say we have fellowship with him while we walk in darkness, we lie and do not practice the truth. 7 But if we walk in the light, as he is in the light, we have fellowship with one another, and the blood of Jesus his Son cleanses us from all sin. 1 John 3:4-10 : Everyone who makes a practice of sinning also practices lawlessness; sin is lawlessness. 5 You know that he appeared in order to take away sins, and in him there is no sin. 6 No one who abides in him keeps on sinning; no one who keeps on sinning has either seen him or known him. 7 Little children, let no one deceive you. Whoever practices righteousness is righteous, as he is righteous. 8 Whoever makes a practice of sinning is of the devil, for the devil has been sinning from the beginning. The reason the Son of God appeared was to destroy the works of the devil. 9 No one born of God makes a practice of sinning, for God’s seed abides in him; and he cannot keep on sinning, because he has been born of God. 10 By this it is evident who are the children of God, and who are the children of the devil: whoever does not practice righteousness is not of God, nor is the one who does not love his brother. As children of a fluid, shifting culture, we tend to put sins into boxes labeled “Excusable”, “Serious”, “Naughty but nice.” But the unchanging God has no such categories. According to the apostle John, all sin originates with Satan, who makes it his business to lead us away from our Creator and onto a path of sin and rebellion against Him. That path may look innocuous and fun, but all sin is “lawlessness” and ultimately leads to death (1 John 3:4 ; James 1:15 ). If you are a Christian, sin will always torpedo the joy Christ gives you (John 15:11 ). It will grieve God’s ‘seed,’ the Holy Spirit who lives in you (1 John 3:9 ; Eph 4:30 ), and it displeases the Father who purchased you at a great price (1 Thess 4:1 ). Just as darkness and light have nothing in common, God’s Spirit doesn’t mix with sin in our lives (1 John 3:7 ;9 ). When we ‘practice sin’, we are rebels against God and cannot have fellowship or peace with Him or others. We are even at odds with ourselves (1 John 1:6 ,7 ). Since sin is essentially placing ourselves on the throne instead of God, it is the ultimate wrecking ball. There is no unhappier person than a Christian chasing treasure and pleasure apart from God. When the infamous Spanish explorer Cortez arrived in the New World in 1519 with 600 men, he ordered them to burn all the ships. His message was clear, “There’s no turning back.” Two years later he conquered the Aztec empire. Likewise, every Christian must die to self before following Jesus and taking our place in God’s family (Mark 8:34-35 ; Luke 14:27 ). This means turning our back on sin and those thought patterns which go against God’s commands and character. In the blink of an eye, the cozy familiar ships can take us back to our old habits and the old self which used to rule us. The byproducts of sin are dire, and that’s why we cannot play or flirt with it. We are called first to own and then disown our sin. That means to confess our sin to God and then turn against it so that it loses its grip on us, to stop excuses and blame, to leave ourselves no option but to trust and obey God going forward. It means hating not just the effects of sin, but the sin itself. It can be like a painful amputation or a violent struggle, but the alternative is even more painful: If you are a true child of God, sin steals your peace, it gives you a heavy heart, and you will have no rest while you are still serving it. That’s why burning the ships is not optional! If ‘burning the ships’ is too dramatic an image for you, let me give you a more concrete example from my own life: One of the joys of writing The God Walk is that the Holy Spirit is first tattooing on my own heart what I pass on in my devotions. (Tattoos are painful but hopefully the effects are permanent!) Yesterday as I was writing this, I was feeling aggrieved by something and it made me too agitated to write, so I got on my knees and asked the Lord to show me why my response was so disproportionate to the offence. The Spirit showed me that the root of my heaviness was a false treasure, something I cared about too much, a source of satisfaction I was seeking and serving. So, as I confessed this particular idol, I asked the Lord to help me ‘burn the ships’ so I could not return to it. I asked him to change my heart so that I would despise it and throw it in the fire. It was a struggle that went on all day each time my mind raced back its stupid destructive obsession. I realized that deep down I didn’t really want to burn that ship completely and confessed that too. There is perverse pleasure in holding onto sinful thoughts and I am a chief self-saboteur! But I have learned the war language of 2 Corinthians 10:5 , “We demolish arguments and every pretension that sets itself up against the knowledge of God, and we take captive every thought to make it obedient to Christ.” It is the internal battle of every believer, as Paul describes in Romans 7. By the time the sun set, I received that wonderful gift that only the Spirit can give. John calls it a “heart at rest” (1 John 3:19 ), an assurance that we belong to the truth. Those destructive feelings abated and I was released from their tyranny. John says we can have confidence before God and know our prayers are heard “because we keep his commands and do what pleases him”, starting with believing in his Son, Jesus Christ. (1 John 3:22 , 23 ). We do what is right and then our feelings will follow. Keeping God’s commands is a daily struggle of confessing, believing Jesus and actively ‘burning the ships’ of our sinful desires, regardless of our feelings. Remember that John is not saying a Christian will stop sinning completely, but that we will not “keep on sinning” without a care. Sin leads to sorrow and death, but holiness leads to happiness and life. Sin in disguise: Live it out! What complicates matters is that Satan masquerades as an angel of light and sin does not always look like death and darkness (2 Cor 11:14 ): ‘Self esteem’ may be a handy disguise for pride. Gossip and slander may be dressed up as ‘sharing prayer needs’. Greed and envy may masquerade as ‘ambition’. Cheating often hides behind ‘competition’; boastfulness behind ‘assertiveness’; manipulation behind ‘victimhood’. Bitterness and unforgiveness can lurk behind a legitimate ‘grievance’. Rudeness may be labelled ‘task driven’. Unfaithfulness or unkindness can be justified as ‘authentic’ and ‘being true to self’. If denying ourselves and taking up our cross is Christ’s command to every believer, we can be sure that burning our ships means killing every sneaky version of self promotion—self righteousness, self pity, self absorption, selfishness, self protection and narcissism….That’s the flesh. Pride may seem like a protective shell, but it makes us hellbent on destruction. Pride does not mix with God’s Spirit inside us. Pride blinds us to Satan’s schemes to destroy our faith, our relationships and our witness to the world. If Satan has evil schemes, Jesus has a good mission— to “destroy the works of the devil” (1 John 3:8 ). Satan’s name means ‘accuser’ and his modus operandi from the beginning has been to accuse, deceive and deface the image of God in us. Satan delights in leading humans into sin so that he can accuse us before God and demand judgment. But the gospel writes a different script for Christians: Sin is so serious that God’s own innocent Son had to come to earth as a man to die in our place, to take our sin away, so that we would not face the judgment of God (1 John 3:5 ). That’s how Jesus destroys Satan’s works on the cross. But whenever we tolerate sin patterns in our lives, we collude with Satan. Sin is treason against God, a foothold for the enemy to deface God’s image and glory in us. But when we live lives of holiness and obedience, we live under the blessing and protection of our heavenly Father. That is pure joy. No matter how hard our struggle is, there is incredible happiness for a Christian who walks in holiness, abiding daily in Christ (1 John 3:6 ). 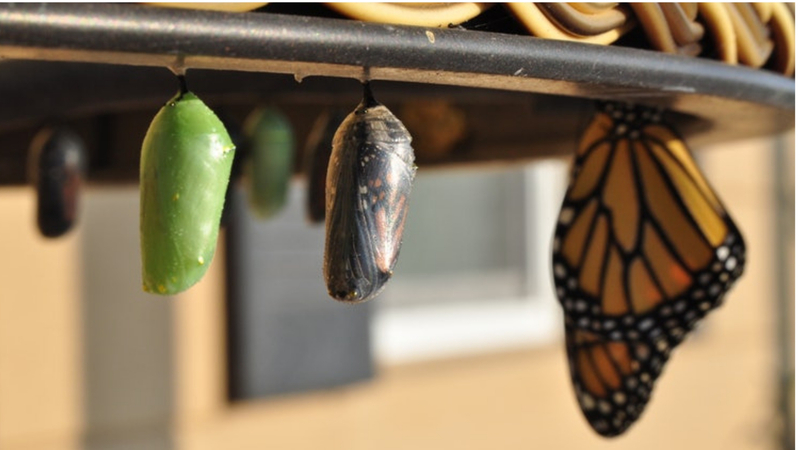 Sanctification is like the process of a worm transforming into a butterfly. It means dying to the old self and coming alive as a beautiful new creation. It is the only route to wholeness. Meditate on these commandments of God: 1 Cor 6:9-11 ; 2 Cor 6:14 ; Titus 2:12 ; Eph 5:3-5 ; Gal 5:19-21 ; Col 3. Which of God’s commands has the Holy Spirit convicted you of lately? What sin are you slaying in your life right now? Pray for the Spirit’s power to deal with the most insidious sin that underlies all other sin: Pride. Burn the Ships (For King and Country–Click and listen here.) Download the whole album on Itunes. There is a personal story of sin-killing behind the song– a great reminder to step into a new day and kill sin… or it will kill you. Next week we will explore God’s great command to love (and not to love). Love is the second mark of being born of God. We will continue in John’s first letter as we dig deeper into the doctrine of Sanctification. The key to living out our adoption in flesh-and-blood lives, is the Aramaic word “Abba” (Rom 8:15 ). Abba translates as dadda, the phonetic sound an infant would use before he can utter his first word. Think of a baby holding her daddy’s face and expecting to be fed, protected and loved. There is complete trust and dependency implied in the word. No question of earning Abba’s love or approval. No attempt to manipulate Abba. You and I “cry Abba” when we run like a child towards our heavenly Father to pray to him. We have direct access to Him because we have put our faith in the Lord Jesus, the one and only mediator between sinful people and a holy God (1 Tim 2:5 ). Like that trusting infant, we simply open our arms to receive God’s gracious gift of adoption. We don’t wear ourselves out trying to ‘make God’s team’ or prove our worthiness. We don’t fear being sent away. It is only because Jesus is worthy that you and I can boldly approach God’s throne of grace (Heb 4:16 ; Eph 1:7 ). Our prayers to Abba are nothing like the ritualistic prayers of those who do not know God as their Father (Matt 6:5 ;6 ;7 ;8 ). We do not relate to Abbalike He is the Genie of the Lamp, with prayers to impress or demand His favour. We know we have it already, covered in Jesus’ robe of righteousness (Rom 4:4-6 ; Isa 61:10 ). We are children, not slaves! Look up child, into your Father’s face instead of the face of your circumstances. Children of God have a primal connection with their perfectly good, strong, faithful and loving Abba Father. When they run to Him for refuge, fear gives way to confidence, devotion and a desire to please Him. This boldness reminds me of my two dogs, Honey (the terrier) and Caspy (the retriever) below. When we adopted our no-name brand, “Honeydew” from the SPCA, she was terrified of everyone and everything. She had been rescued on the busy highway near Honeydew, hence the name! It was obvious that her early months of life had been scary if not abusive, and I often had to claim her at the vet’s rooms after she bolted from me in Delta Park. Her panic could be triggered by something as innocuous as a man riding towards her on a bike. 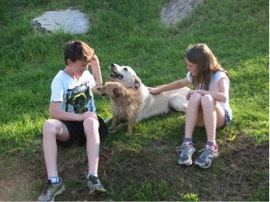 Everything changed when we brought our golden retriever, Caspian (‘Lionheart’) home. My son chose him because he was the biggest and gentlest in the litter. Caspy soon outgrew Honey and claimed his spot as top dog. But something significant changed too: Gradually Honey transformed into a bolder, braver terrier than ever before as she hid behind her big brother, Caspy, the most friendly, fearless dog I know! After six years, Honey has become Caspy’s shadow, barking and wagging her tail as if she belongs to our family and proud of her role as guard dog! There’s no trace of fear as long as Caspy is near, but alone, Honey is timid and lost. It’s best not to bend this analogy too far or it will surely break, because trust me, Caspy is unruly and nothing like Jesus! But Honey’s transformation is a little like our own when we become Abba’s children. As we learn to trust and tuck in behind Jesus, our big brother, we start to believe that we do indeed belong to God’s family. We embrace our forgiveness and it dawns on us that we are truly at peace with God. The reality that we are in Christ trickles from our head into our heart and we start to live as though we are true heirs of the blessings that Paul describes in Ephesians 2. Little by little, fear and sin no longer have the power to control us and we relate to God as if He is indeed our Abba. In place of fear, we have a Father. The question we must ask ourselves is this: Which father do we believe? Our heavenly Father or the father of lies?